While Hua Hin might not have the stunning beaches of Phuket or Samui, its sands are certainly a lot more scenic than Pattaya’s and, at around two hours from Bangkok, it is certainly the nearest and dearest beach resort for those seeking a weekend escape from the capital. There are plenty of pampering resorts to choose from, and the old town remains development-free and still retains a lot of charm. The town is associated with Thai royalty, as it was built up by King Prajadhipok in the 1920s and is home to the present royal family today. For proximity to a good beach resort, Hua Hin can’t be beat. With a private car, you can be down here in less than a few hours, and the plethora of public minivans from Bangkok get down here in about the same. Hua Hin makes for a great stress-free escape from the capital. The old town area is low key, full of quaint antique and retro shops, along with simple mom-and-pop family-style eateries. 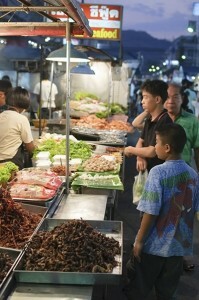 The night market has tasty cheap seafood, there are few hassles from the touts, and the annual Hua Hin Jazz Festival—held yearly in June—has become one of Asia’s best, bringing in big international jazz stars to perform on large stages. Even if you don’t come here by train, you should have a look at Hua Hin’s railway station. It is one of Thailand’s oldest train stations, built by Rama VI in the 1920s, and features the Thai-style Royal Waiting Room, used to greet the king and his court, built in the same style as Maruekkhathayawan Palace in Cha Am. The Cicada Market (Petchkasem Rd; 032 536 606) has become a weekend staple in Hua Hin, where handmade crafts and art goods are sold, accompanied by live music and art performances. Santorini Park (032 772 999; www.santoriniparkchaam.com) is Hua Hin’s latest theme park (it’s actually just up the road in Cha Am). This perfectly recreated Greek island getaway, complete with whitewashed and blue-painted houses, features amusement park rides and boutique shopping. Other than lazing on the beach, a pilgrimage to Khao Takiab mountain is in order. This small peak, lying toward the south end of town, has a Buddhist temple up top, and gives a commanding view of the entire Hua Hin area, which gives extensive panoramas and photo ops in every direction. If sunning your buns gets a bit tedious but you still want to hang out on the beach, Hua Hin has the privilege of being the only beach in Thailand where you can go horse riding. The Hua Hin Horse Club (089 378 1266; www.horseridinghuahin.com) offers riding lessons and more to bring all your equestrian fantasies to life. Visitors to Hua Hin shouldn’t miss making the trip down to Khao Sam Roi Yot National Park (www.dnp.go.th), which is less than an hour south from town. This fantastic nature escape is home to quiet beaches, great hiking, abundant birdlife, and an amazing sinkhole cave where beams of light shine on a throne room built in the cave for King Rama V.
The Living Room Bistro and Wine Bar (3 Soi Hua Hin 51, Damroengrat Rd; 032 530 487) is the latest player on the burgeoning Hua Hin gastro scene, serving up fusion dishes in a ‘50s-style wooden beach house. 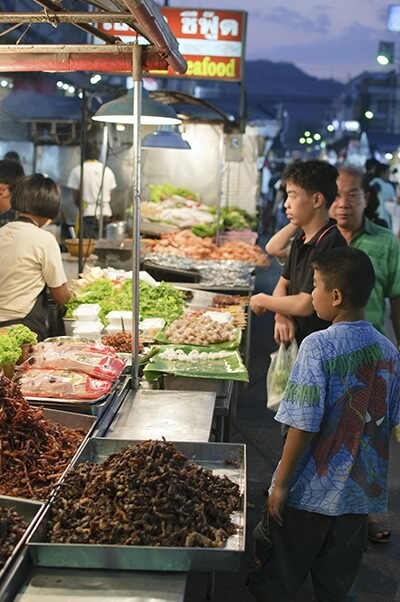 The Night Market (Damnoen Kasam Rd, next to the train station) may not have air con and fine silverware, but is well worth a visit, with vendors dishing out generous portions of curried crab and king prawns along with plenty of other fresh seafood. True to its name, La Birra (Hua Hin Khao Takiab Rd; 084 567 6989) serves up a variety of excellent imported beers to go along with Italian pasta in an al fresco Mediterranean-style bistro setting. If you’re craving a Moroccan tajine, the sensual Al Hamra (63/411 Petchkasem Rd; 032 616 777), in the opulent Marrakesh Resort, creates Moroccan and fusion dishes in an authentic Moorish setting. Super convenient minivans leave from Victory Monument in Bangkok every 20 minutes or so, dropping you off in downtown Hua Hin a few hours later. The train is also a relaxing means of travel, and the express train 43 leaves Bangkok’s Hualamphong Station at 8:05 a.m., calling in at Hua Hin at 11:25 a.m., with tickets including lunch service. There are also buses to Hua Hin from the Southern Bus Station, but this is pretty unpractical for most folks due to the distance from downtown Bangkok out to the terminal, which sits far over on the Thonburi side of town. 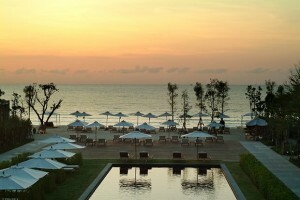 Hua Hin and nearby Cha Am and Pranburi certainly have no shortage of gorgeous resorts to rest up in. They are lined with some of Thailand’s poshest resorts, and there is a staggering list of great places to pamper oneself in whether they be private villas, landscaped gardens, beachfront property, fine dining, or the total seclusion that you are looking for. Top spots include the boutique Hotel De La Paix (www.hoteldelapaixhh.com) in Cha Am; designed by noted Thai architect Duangrit Bunnag, it’s full of shiny marble, aged timber, reflection pools, and plenty of space for dining under the stars. V Villas (www.v-villashuahin.com) in Hua Hin has 23 elegant pool villas in Italian villazzo design, all equipped with state-of-the-art Bose entertainment systems; the hotel’s award-winning Villazzo Restaurant offers a range of pastas, pizza, superb fresh seafood, and plenty of Thai dishes as well. The Putahracsa (www.putahracsa.com) offers stylish digs set in the historic district of downtown Hua Hin, and its Oceanside Restaurant is a great spot for romantic dinners; other nice touches here include horizon ozone pool villas and a pampering spa. Down the road in Pranburi, Villa Maroc (www.villamarocresort.com) features a bit of Morocco in Thailand, with exotic riad-style mansions with courtyards and pools, plus the award-winning Casablanca Restaurant and Shisha Bar to add to your North African fantasies. The Moroccan craze doesn’t stop here either, with The Marrakesh Hua Hin Resort & Spa (www.marrakeshresortandspa.com) getting in on the action, with Jacuzzi suites and plenty of mosaic tile work and bright colors to complement the Arabian fountains. The prestigious Hansar (www.hansarpranburi.com) has also opened a property in Pranburi, with a gorgeous resort nestled against the 300 peaks of Sam Roi Yot and set on one of Thailand’s last undiscovered beaches. Also in this area you will find the swank X2 Kui Buri Villas (www.x2resorts.com), set on four acres of virgin beachfront land, and featuring private villas with pools. 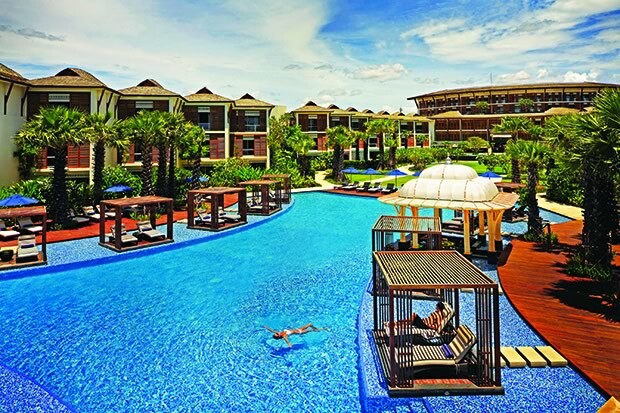 The Sheraton is also in on the action here with two properties: The Sheraton Hua Hin Pranburi Villas (www.sheratonhuahinpranburi.com) has private villas along the beachfront surrounded by lush tropical gardens and waterways, and is a superb spot to get away from it all. Up the road, the Sheraton Hua Hin Resort and Spa (www.sheratonhuahin.com) has an immense lagoon-shaped pool, one of Thailand’s most impressive swimming locales in which to cool off, to go with its trademark upscale rooms and facilities. Not to be left out, the Hilton Hua Hin Resort and Spa (www3.hilton.com) has stylishly appointed rooms with balconies overlooking the sea, and a staggering choice of 10 restaurants and bars from which to imbibe the surroundings. For something different, the Sansiri Hotel Collection’s Escape Hua Hin (www.escape-hotel.com) has re-created the look of traditional Hua Hin fishing villages, with red-roofed villas set around a beautiful pool, with Sand, Sun, and Sea rooms to choose from, each incorporating different scents, colors, and music. Surrounded by lush greenery, the Dusit Thani Hua Hin (www.dusit.com) resembles a Mediterranean villa retreat with Thai touches, and the large pool is flanked by an ornamental lake and lily pond; outstanding service and amenities complement the elegant surroundings. If you are looking for colonial and historic charm, the Centara Grand Beach Resort and Villas (www.centarahotelsresorts.com) has taken over one of Asia’s most classic hotels: the 1923 former railway hotel, with 42 villas that boast period-style furniture, hardwood floors, and Thai silk amongst the trappings of luxury. For a private lakeside retreat, you’ll be hard pressed to outdo the Aka Hua Hin (www.akaresorts.com), where luxury villas feature such delights as private infinity pools and open-air sunken baths. The resort is set on 20 acres of verdant landscape, with sala gardens and an infinity pool adding to the meditative atmosphere; guests can take advantage of private villa dining to suit any occasion. The Intercontinental Hua Hin (huahin.intercontinental.com) has a great beachside location and boasts unique features such as the two-story colonial beachfront digs, La Residence. Also not to be missed here is the enormous 55 square meter infinity edge pool, which comes complete with a fiber optic system to create a twinkling starlight effect come nighttime. 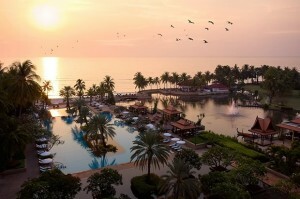 Not far from the airport, the Hyatt Regency Hua Hin (huahin.regency.hyatt.com) boasts the longest beachfront of all of Hua Hin’s hotels. The resort’s decadent Barai Spa has 18 exotic treatment rooms in which to pamper oneself, and there is a river, lagoon, and beach pool here, all of which are interconnected, along with a 22-meter water slide, ensuring you will never get too overheated while on holiday in the Gulf of Thailand. Springfield@Sea Resort (858 Jumnong Poomivej Rd; 032 709 300, www.springfieldresort.com/atsea/index.html) is a stylish modern tropical paradise set around a massive pool, with 105 rooms tucked away in lush gardens offering sea and beach views, which you can admire from the porch swings that come with every room. A water slide and rain curtain fountain are part of the abundant waterworks here, and everything is lit up at night with glowing multi-colored lighting, creating a dynamic display. Mida De Sea (1349 Soi Cha-am 53 (Bo-Kia Road); 032 771 976–85, www.midadeseahuahin.com) is a chic and stylish resort with 113 rooms that feature private terraces and balconies overlooking the sea, with each contemporary designed suite coming with plenty of five-star amenities. Those opting for suites on the second level have direct access to the gorgeous elongated swimming pool that is the centerpiece of the property. 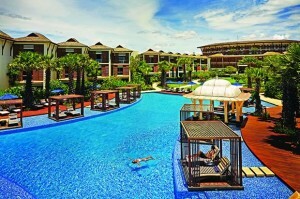 Plus Property (www.rentalfortheholidays.com) offers three options in Hua Hin: The “Rental for the Holidays” program provides utmost comfort with resort-environment accommodation, first-class facilities, and particularly affordable rates when reserved on a monthly basis; they offer a variety of room types. Baan San Ploen beachfront condominiums, also available for rent, are only a five-minute walk to Hua Hin’s Night Market. And Chelona, a luxury beachfront resort condominium complex, offers a luxury experience in Mediterranean-style architectural design, with white plaster walls and bright blue doors and window frames.